What a moment to do that. Wow. 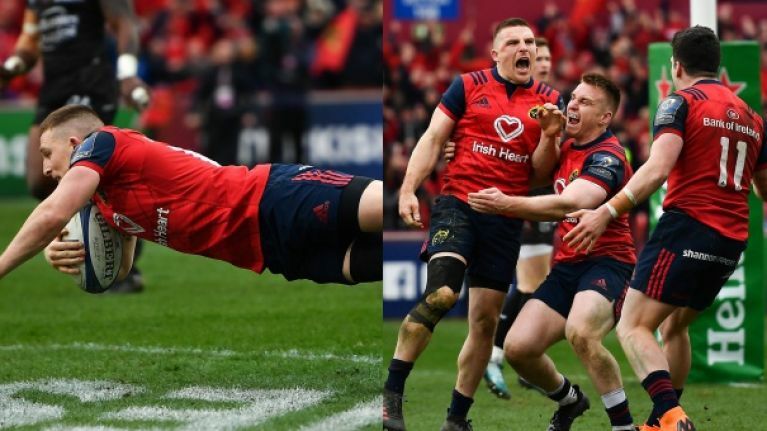 With just a few minutes remaining at the end of a breathless, chaotic and absorbing Champions Cup quarter-final between Munster and Toulon at Thomond Park, Andrew Conway produced a moment of magic to seal it for the Irishmen. With Toulon leading 19-13, Francois Trinh-Duc kicked to touch but Conway collected. Coming inside, the 26-year-old wing flew through the wearying visitors to score a fantastic try and put Munster back in the ascendancy. Keatley converted and Munster were suddenly edging an electric encounter 20-19. Watch the moment of magic below. Conor Murray had earlier produced a razor-sharp moment of genius to stun the province's opponents but Conway will surely be the toast of Limerick tonight, taking the game by the scruff of the neck at the most crucial moment.